I am in desperate (well that might be a slight exaggeration) need of a cool new clutch. 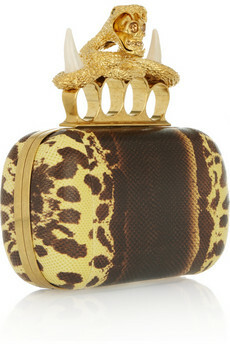 Obviously I went straight to Net-A-Porter where I found this magnificent Alexander McQueen one. I bask in its glory. The serpent skull, the brass gold, the snakeskin, the knuckle grip. It’s all pure McQueen genius and I love it. Just need to work out where I can find £1,150 to get it…. Any ideas? "Love a Bit of Leather…Love a Bit of Balmain"